Wabash College will bring to campus eight thought-provoking speakers when it hosts its third TEDxWabashCollege event on Saturday, Feb. 2, in Ball Theater of the Fine Arts Center. TEDxWabashCollege brings together speakers from across the country to share their innovative ideas and stories with Wabash students, faculty, and staff, as well as the greater Crawfordsville and Indianapolis communities. “We are excited to bring so many people together to listen and learn on a day full of amazing ideas, great food, and thought-provoking conversation,” said organizer Sam Stewart. The event begins promptly at 3 p.m. and ends at 6:30 p.m. In addition to the eight, 15-minute (or less) talks, attendees will receive heavy hors d’oeuvres, beverages, t-shirts, and entertainment during intermissions. Speakers range from a world-renowned photographer to a Harvard University professor, along with several entrepreneurs and Wabash student William Yank, who withdrew last fall to wage his battle against cancer. Long-time Indianapolis television anchor Bruce Kopp will serve as master of ceremonies. The theme this year is “Past. Present. Future.” Talks will focus on how we can learn from the past to make better decisions in the present, and how ideas, processes, and products have evolved over time, including where they are headed in the future. Speakers include television actress Taylor Misiak; community organizer and entrepreneur Joanna Taft; photographer Seth Taras; psychiatrist and Harvard professor St. Steven Schlozman; virtual reality artist and designer Suzanne Leibrick; life and relationship coach Juna Mustad; government and public safety expert Troy Riggs; and Wabash student Will Yank. 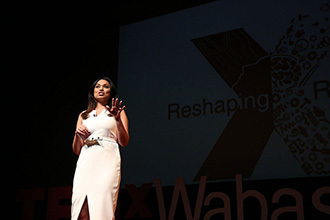 The 2018 TEDxWabashCollege event focused on the theme of “Reshaping Reality.” YouTube videos of the talks over the first two years have generated more than 450,000 public views. “We have listened and learned from our team members, our fellow students, the administration of Wabash College, and most importantly the community members who attend our event, and we are excited to showcase new ideas and new revelations in our third annual TEDxWabashCollege event,” Stewart said. Wabash students manage all aspects of organizing TEDxWabashCollege, from selecting speakers from all across the country and executing all of the logistics associated with the event. “The hours of work that we have put in this past year are totally worth it when our attendees tell us how much fun the event was, and how they’ve already marked the date on their calendar for the following year,” added co-organizer David Riggs. The 2019 TEDxWabashCollege event is sponsored by the Robbins Family Fund with support from Wabash College, First Merchants Bank, Priority Engineering, the Indianapolis Association of Wabash Men, Crawfordsville Country Club, QuickLifts, and Dreyer and Reinbold Infiniti.